The legal framework and potential threat of a Chinese-built interoceanic canal across Nicaragua garnered a strong ‘No al Canal’ movement because the concession, Law 840, sanctioned significant human and environmental rights violations. This chapter analyses the important role played by women in the movement and employs a feminist perspective to explore how two leaders leveraged their unique identities, as a farmer and a lawyer respectively, to obtain national and international support for the movement. It also examines ways in which the ‘No al Canal’ movement employed the language of the original founders of the Sandinista National Liberation Front as a kind of rhetorical trap to reinforce how far the Nicaraguan government had deviated from the original Sandinista philosophy in authorizing the building of the canal. 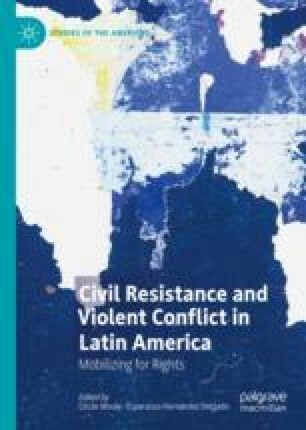 Finally, this chapter explores how the ‘No al Canal’ movement maintained nonviolent discipline, even in the light of violent repression by the regime against the protestors. Amnesty International. 2016, October 16. We Have Hope, We Have Human Rights, We Will Win This Fight. https://www.amnesty.org/en/latest/news/2016/10/we-have-hope-we-have-human-rights-we-will-win-this-fight/. ———. 2017, January 18. Danger: Rights for Sale. The Interoceanic Grand Canal Project in Nicaragua and the Erosion of Human Rights. https://www.amnesty.org/download/Documents/AMR4365152017ENGLISH.PDF. Anderson, John Lee. 2014, March 10. The Comandante’s Canal: Will a Grand National Project Enrich Nicaragua, or Only Its Leader? The New Yorker. https://www.newyorker.com/magazine/2014/03/10/the-comandantes-canal. Cerda, Arlen. 2016, March 14. A Leader in the Struggle to Stop the Nicaragua Canal Project. Confidencial. https://confidencial.com.ni/leader-in-the-struggle-to-stop-the-nicaragua-canal-project/. Chamorro, Emiliano, and Roy Moncada. 2017, April 23. Gobierno impidió la protesta campesina. La Prensa. http://www.laprensa.com.ni/2017/04/23/nacionales/2218540-gobierno-impidio-la-protesta-campesina. Civicus Monitor. 2016, December 15. Brutal Repression of Protests against Nicaragua Canal. https://monitor.civicus.org/newsfeed/2016/12/15/brutal-repression-protests-against-nicaragua-canal/. European Parliament. 2017, January 7. Joint Motion for a Resolution on the Situation of Human Rights and Democracy in Nicaragua—The Case of Francisca Ramírez. http://www.europarl.europa.eu/sides/getDoc.do?type=MOTION&reference=P8-RC-2017-0156&format=XML&language=EN. Galeano, Luis Manuel, and Michael Weissenstein. 2013, December 12. Nicaragua in Thrall of Ortega’s Canal Dream. San Diego Union-Tribune. http://www.sandiegouniontribune.com/sdut-nicaragua-in-thrall-of-canal-dream-worries-remain-2013dec12-story.html. Gonzalez, Alejandra. 2017, April 30. Mónica López Baltodano: “Ortega odia al movimiento campesino.” Prensa Libre. http://www.laprensa.com.ni/2017/04/30/suplemento/la-prensa-domingo/2221855-Mónica-López-baltodano-ortega-odia-al-movimiento-campesino. International Federation for Human Rights (FIDH). 2016. Nicaragua: Impact of Interoceanic Canal Concession on Human Rights. The Resistance of Rural Communities. https://www.fidh.org/IMG/pdf/nicaragua_sumup_english.pdf. Organization of American States. 2018, August 2. IACHR Confirms Reports of Criminalization and Legal Persecution in Nicaragua. http://www.oas.org/en/iachr/media_center/PReleases/2018/169.asp. Salomon, Josefina. 2017, August 30. The Cost of “Development”: The Government Sees Nicaragua as Their Estate and Us as Their Animals. https://www.amnesty.org/en/latest/news/2017/08/the-cost-of-development-the-government-sees-nicaragua-as-their-estate-and-us-as-their-animals/. Soutar, Robert. 2017, August 30. The Nicaragua Canal Becomes the Government’s Achilles Heel. Dialogo Chino. https://www.opendemocracy.net/democraciaabierta/robert-soutar/nicaragua-canal-becomes-government-s-achilles-heel. Vasquez, Vladmir. 2017, May 5. El registro escrito de la lucha campesina. Confidencial. https://confidencial.com.ni/registro-escrito-la-lucha-campesina/. Watts, Jonathan. 2015, January 2. Opponent of Nicaragua Canal Says He Was Badly Beaten by Police. The Guardian. https://www.theguardian.com/world/2015/jan/02/opponent-nicaragua-canal-beaten-police.